I've seen this photo so many times, but until today I had no idea who designed this clever bird feeder. 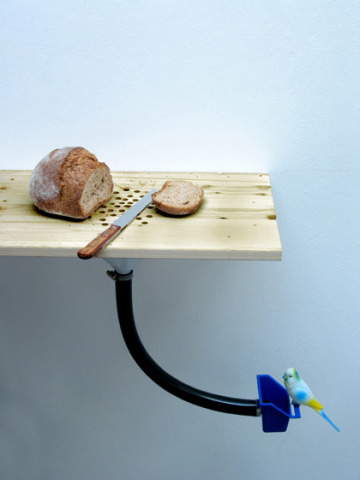 The Bird Crumbs feeder is, in fact, a do-it-yourself project, created by Spanish industrial designer, Curro Claret. Isn't it tooo wonderful? 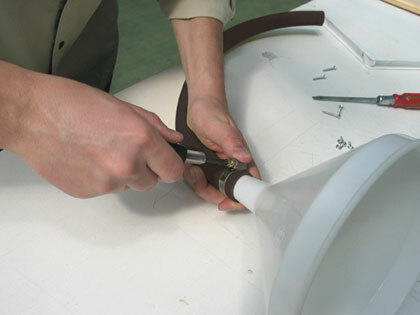 Most people trim the wings of the larger parrots to keep them contained, but they can easily figure out ways to get around by walking and climbing. Parrots love to share people-food because they are very curious, and if people are their primary companions, they confuse themselves with humans. They will want to try everything you eat, but bread crumbs are just the right size for any size bird to scarf up. And the Bird Crumbs feeder is such an elegant design for you and for them. It's really just perfect! Here's what its designer, Señor Claret shares with us. 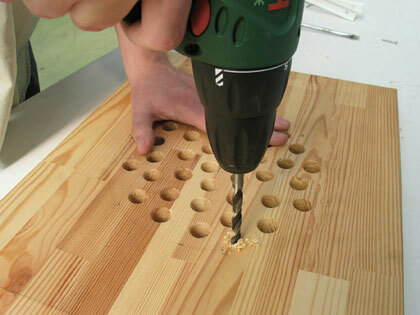 He first drills several holes in his cutting board, which don't at all interfere with the cutting of bread. Then, he affixes a funnel -- just the right size funnel so that all the crumbs that come through the holes are contained -- with an attached hose to the board, apparently nailing or screwing the rim of the funnel to the cutting board. And finally, Claret attaches the food cup with perch, which is the appropriate size for his bird, before affixing the whole project to the wall. With just a few readily available parts, a drill, screwdriver, and some screws, you can create a Bird Crumbs feeder for your bird too! How Could I Quit You, Facebook? You Had Me At "Dumb F*ck"